geosciencebigpicture | Exploring the human situation from the broadest perspective and trying to make reading science fun. We left of the last post having found that brightness temperature was hopelessly asymmetric to radiance in the main CO2 deviation from the Planck temperature. 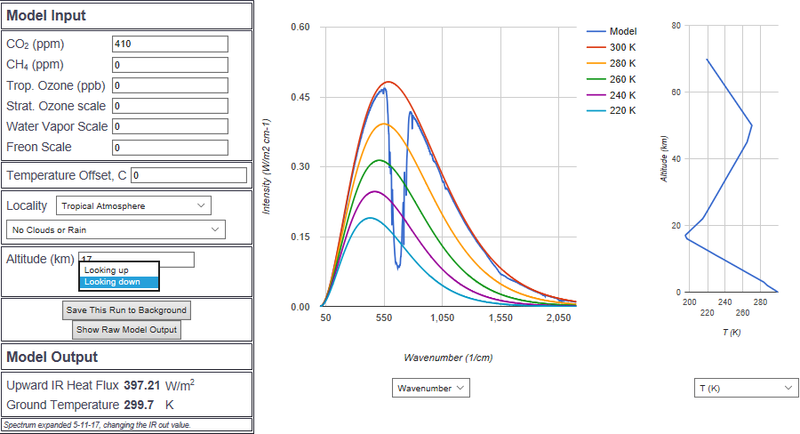 This discovery dashed all hope of using brightness temperature to determine the temperatures of the individual lines. 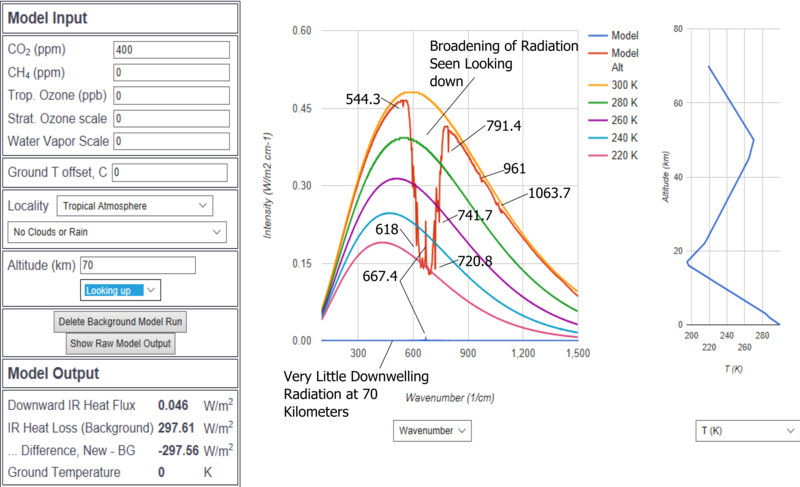 We were able to replicate the form of the radiance deviation using the S-B equation, but the resulting temperatures fall well below atmospheric temperature in the deeper parts of the deviation. Above the asymmetry of brightness temperature to tropical 70 km radiance. 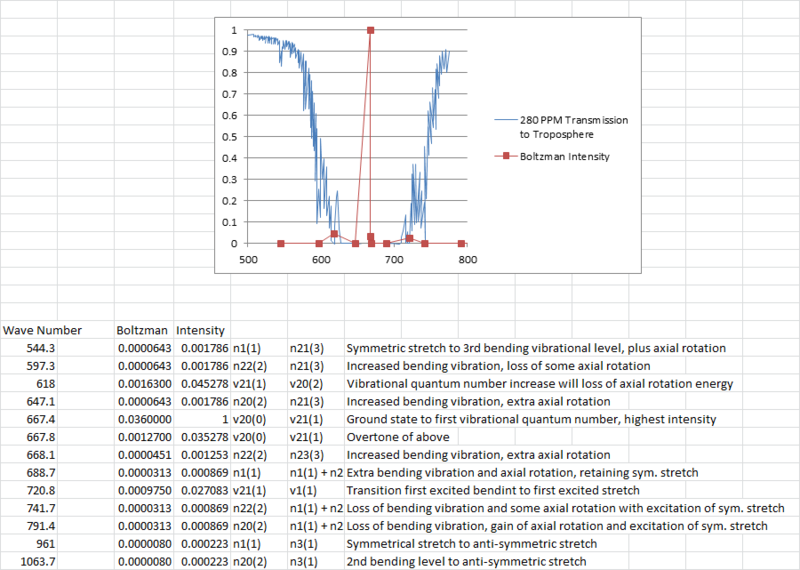 Above excellent symmetry using S-B with emissivity of 2.25, but temperatures of ~80 K at the bottom of the deviation. 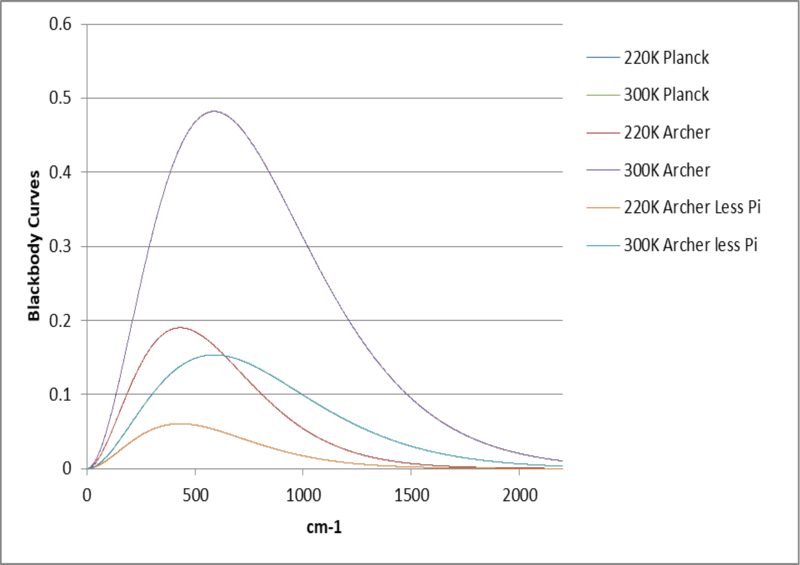 According to the Planck curves the bottom of the deviation is about 220K. 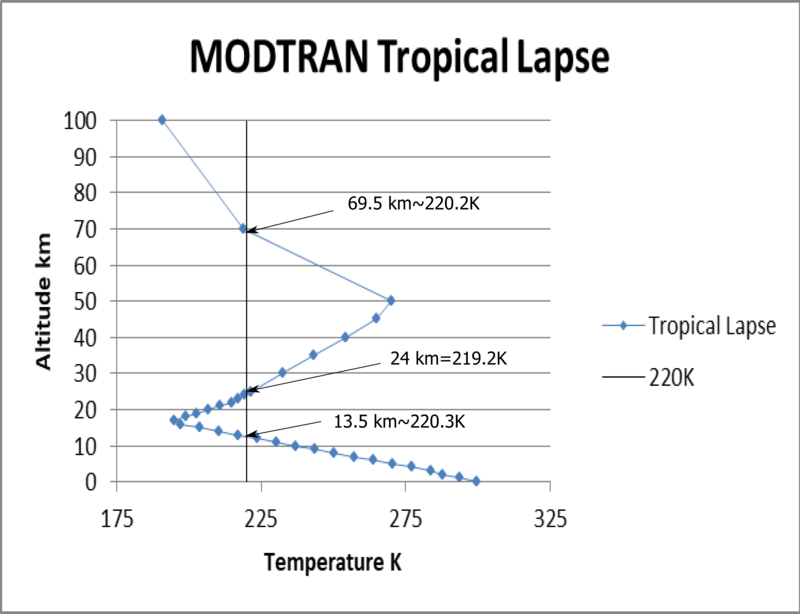 Nothing about this effort has been easy, and the only check we can use on the accuracy of the Planck curves for determining the radiative temperatures of individual lines is to use the temperature of the MODTRAN tropical lapse rate. We report here the results of stepping up in altitude and comparing the strong lines as determined by eyechrometer against our densified Planck curves, with the lapse temperatures of the chosen altitudes. 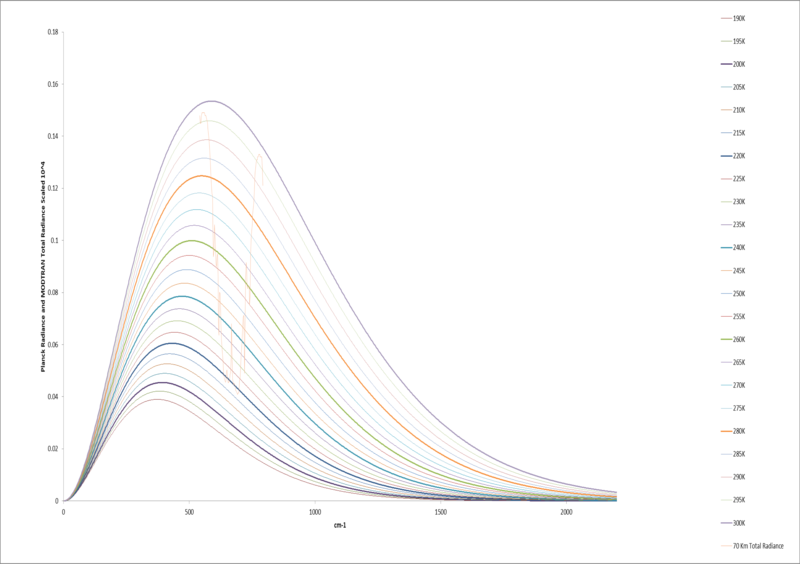 Above we see the eyechrometer results from our 5 degree densified Planck curves. The two fairly flat lines at the top are the top corners of the CO2 deviation, 544 and 792. It can be easily seen from the second graphic below that these change little with altitude. They bound the CO2 deviation, are among the weaker strong lines, and abut “windows” on either side that radiate to space at surface temperature. The next two lines are 598 and 742. They both drop off rapidly with opposite curves through the troposphere, and flatline through the rest of the section. The next two are the stronger lines 618 and 720. They behave more like the by far strongest line (magenta 668). The last two are 648 and 688. They are the boundaries of the rotational bands that follow the fundamental bend at 668. They define the zone of zero transmission to the tropopause, and follow 668 (and the lapse) through the troposphere. At 20 km, where the prominent “spike” at 668 begins, they diverge. An effort was made in the above and prior graphics to crudely use line thickness proportional to absorption intensity. 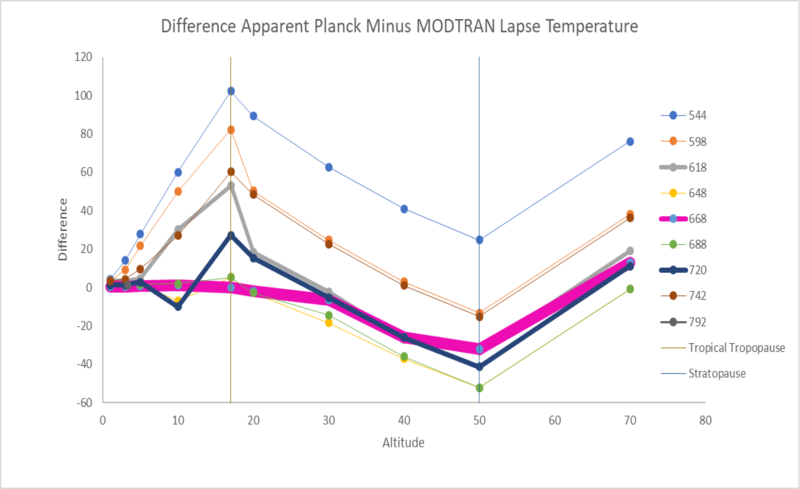 This is the difference between the apparent Planck temperature and the lapse temperature.The strongest line (668) shows the least discrepancy and three strongest lines generally have the least discrepancy. The discrepancy is least at one kilometer elevation. The discrepancy is least at one kilometer elevation. This is not surprising because at one kilometer the deviation from Planck is very small. Above the CO2 deviations are compared at 1 kilometer, 5 Kilometers, 10 kilometers, and 70 kilometers. The strong absorption lines are easily traced up in altitude. 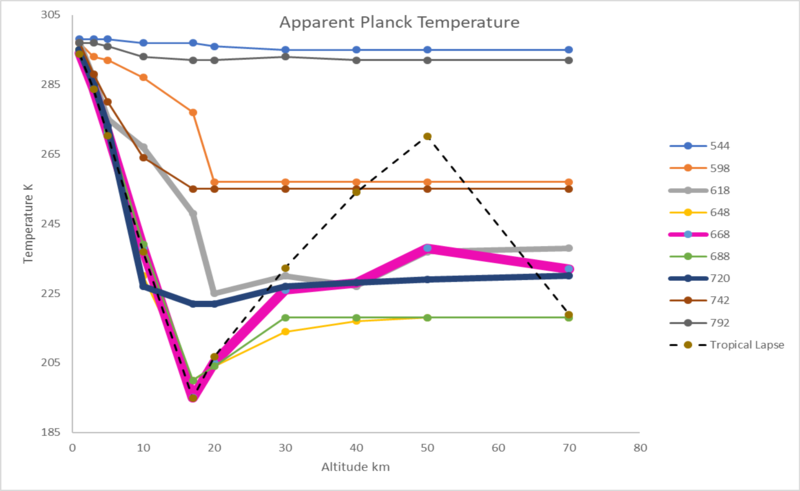 As we progress upward in altitude, the apparent Planck temperature becomes increasingly different from the lapse temperature for most lines up to the tropopause. From the tropopause to the stratopause the differences all lines decrease and reverse sign. The sign of difference reverses again from the stratopause to maximum MODTRAN elevation at 70 km. Shown again above for convenience, positive numbers mean apparent Planck temperatures above the lapse temperature, and negative numbers mean apparent radiance temperatures below the lapse temperature. The radiances and lapse temperatures are both averaged over the tropics, so the systematic discrepancies should mean something. The striking feature is that the sign of the discrepancies follows the lapse rate. When you see a trend of apparent Planck temperatures decreasing relative to the lapse temperature in the stratosphere as the lapse temperature increases with altitude, it must mean that a significant part of the radiance is coming from below. Reversing this logic explains the discrepancies in the cooling with altitude regimes above and below the stratosphere. This sounds a lot like total transmission, but it seems unclear whether the surface in direct line of sight must always be the ground, or whether a different altitude and temperature can be specified. We tried the “Ground Temperature Offset” feature to set one kilometer of lapse as the “surface” TPTEMP, but this merely moved identical radiance 6 degrees (the lapse) down the apparent Planck curves. 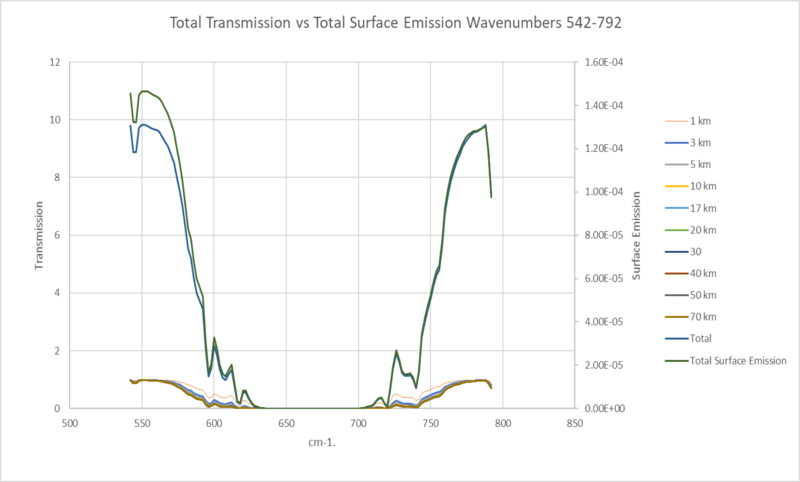 Above we find that Surface Emission and Transmission are very similar except in the lower wave numbers of the CO2 deviation, with emission being somewhat stronger than transmission where they diverge. We have no explanation and find neither useful in determining the radiance from below that seems to drive the difference between apparent Planck and lapse temperatures. In the zero transmission and emission zones, which are the same, there is still radiance from below. This radiance must come from surfaces above the ground. In the next post we will take a stab at gauging above ground radiance (and possibly emissivity) using downward radiance. We left off the last post having accommodated MODTRAN radiance to the Planck curves, and having promised to derive the temperatures of the individual lines from an inversion of the Planck radiance formula to give the Planck brightness temperature. Unfortunately, we were unable to make this work. 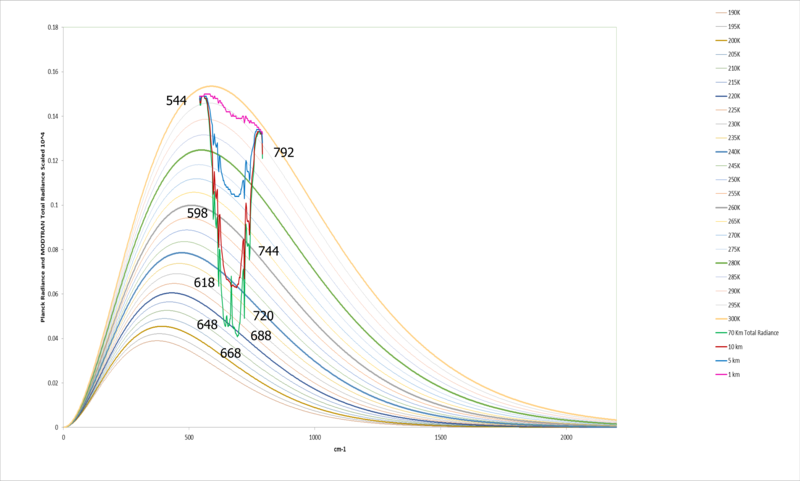 Several different formulae for brightness can be found that yield somewhat different results, but they all show conformance to the general shape of the CO2 radiance deviation. We decided to use the following two because despite their different approaches, when scaled they become identical. We really don’t know what to make of this. The systematic decrease in brightness from lower to higher wave numbers across the CO2 deviation in relation to radiance seemingly gives little hope that useful temperatures can be gained this way. 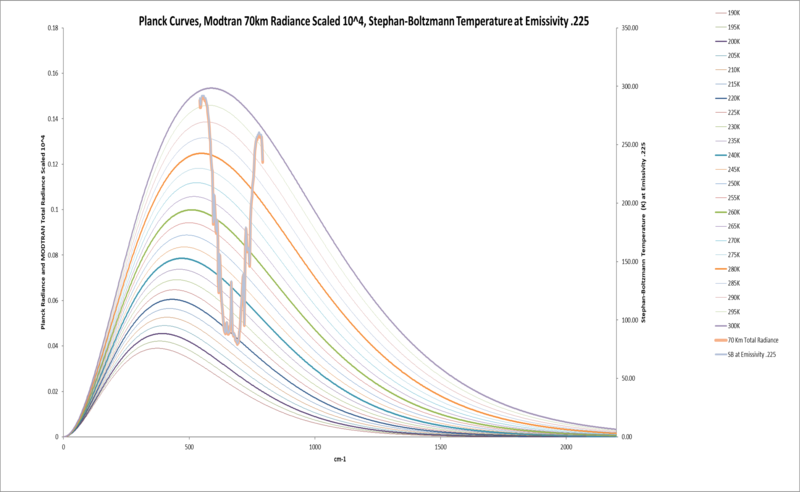 The good news is that a fresh look at the Stephan-Boltzmann approach to temperature using an emissivity slightly above .2 gives a far more satisfying result. Staley and Jurica (1970) derived a full column emissivity for CO2 of .2. We are frankly astonished that by tweaking this slightly higher we were able to get such good agreement across the ~250 wave numbers of the CO2 deviation. Perhaps .225 is the correct column emissivity. At any rate, we will use this approach to get our temperatures henceforth. This post was begun some time ago and we experienced so much trouble replicating the MODTRAN Planck curves that two rambling subsequent posts transpired recounting the misadventure. Here, and here. 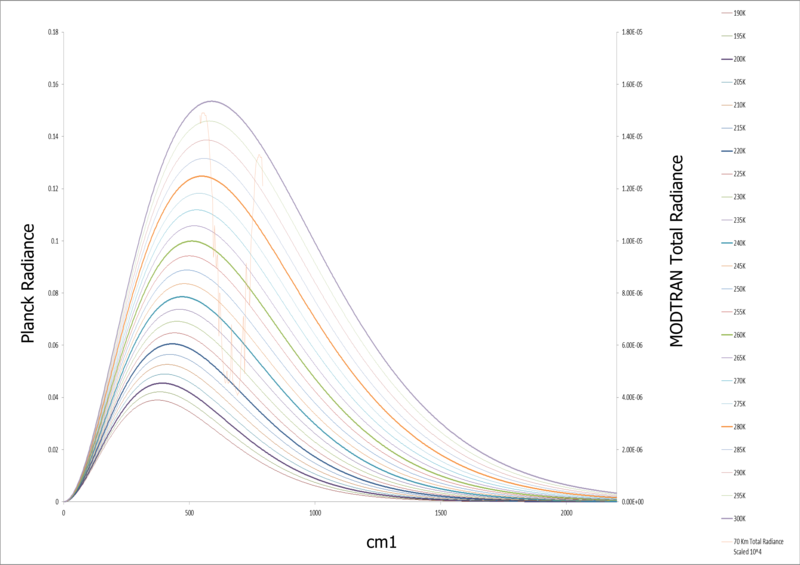 We eventually concluded that the Planck curves in the MODTRAN output graphic can be satisfactorily replicated if the MODTRAN line radiances are scaled by a factor of 10,000. No mention of this tidbit is made in the MODTRAN documentation or many preceding graphics from IRIS satellite measurements plotted against Planck curves. Having replicated the curves vs radiances, it should now be possible to use brightness temperature to determine altitude by lapse, after similarly scaling the radiances. Brightness temperature is simply an inversion of the Planck formula to give temperature rather than radiance. We resume the post below as originally begun. Hold on tight, nothing has been smooth sailing so far. We left off a prior post with the graphic shown again below. It plots MODTRAN CO2 only (the other absorbing gasses zeroed out) 410ppm CO2 total upward IR radiation in one kilometer increments from the surface (1 meter) to 70 km. This is well and good to establish that several watts of CO2 radiance to space is coming from the stratosphere, but what altitudes and which CO2 absorption bands are involved? We established from the graphic above that the deepest part of the CO2 deviation from the surface Planck curve conforms to and radiates at the 220K Planck curve. This portion of the CO2 radiance deviation conforming to the 220K Planck curve corresponds to the rotations linked to the fundamental bending mode of the CO2 molecule. But what is MODTRAN actually seeing from 70 km? The 70 km line of sight crosses 220K on the lapse curve three times! This is where the ability to calculate the emission temperature from the radiance might be helpful, particularly at temperatures that don’t cross the lapse curve three times. In the graphic above we have labelled the significant absorption lines of the CO2 molecule in a CO2 only greenhouse world. 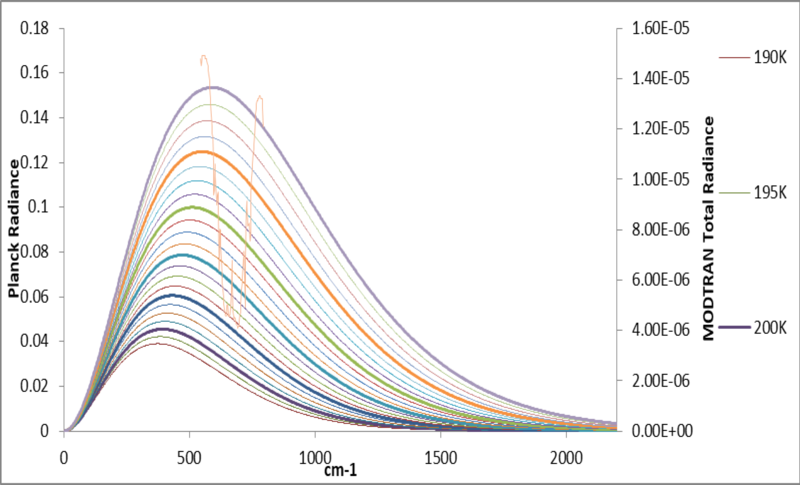 MODTRAN has plenty of resolution to distinguish these according to the table below. If we use our eyechrometer on our densified Planck curves below, we can get approximate radiative temperatures for the significant lines. If CO2 were a good blackbody, we would be able to check these radiative temperatures using the Stephan-Boltzmann equation. We tried this but it yielded temperatures far out of range for our atmosphere. CO2 is a lousy blackbody with a column emissivity of about .2. Applying this correction was no help. In the next post we will check these eyeball temperatures against similarly scaled brightness temperatures. 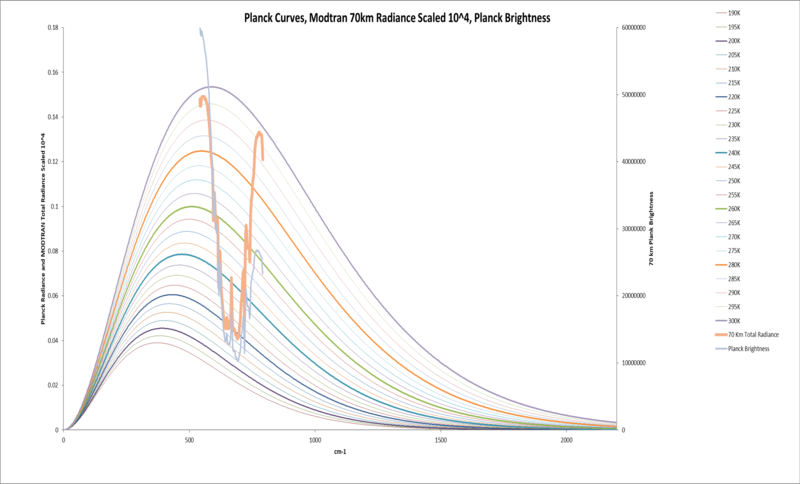 This post reports on some progress on resolving our difficulty replicating MODTRAN Planck curves in a prior post. In a personal communication, Dr. David Archer kindly provided the spreadsheet used to produce the MODTRAN curves. We have reddened the factors where Dr. Archer’s intensity differs from Planck radiance. 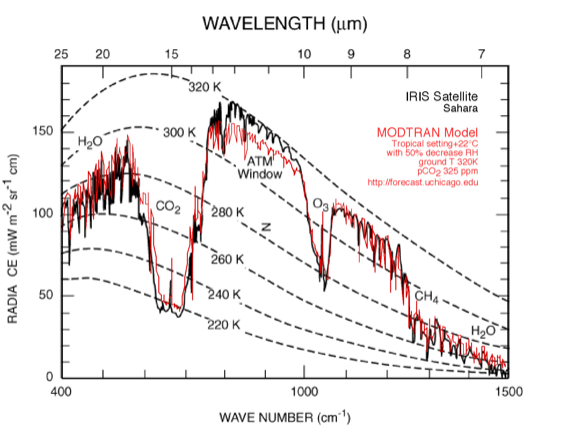 Assumptions can be dangerous, but we assume that when MODTRAN “Raw Model Output” is in units of radiance, the graphic is also in units of radiance. Our intention had been to increase the density of Planck curves for better resolution of the radiative temperatures in the CO2 deviation. Remarkably, we discovered that when the factor of Pi is removed from Dr. Archer’s equation, it yields identical values to the standard Planck equation we have used. What this must mean is that Dr. Archer’s factors of 10^8 in the dividend and 100 in the divisor are symmetrical. If so, why bother? 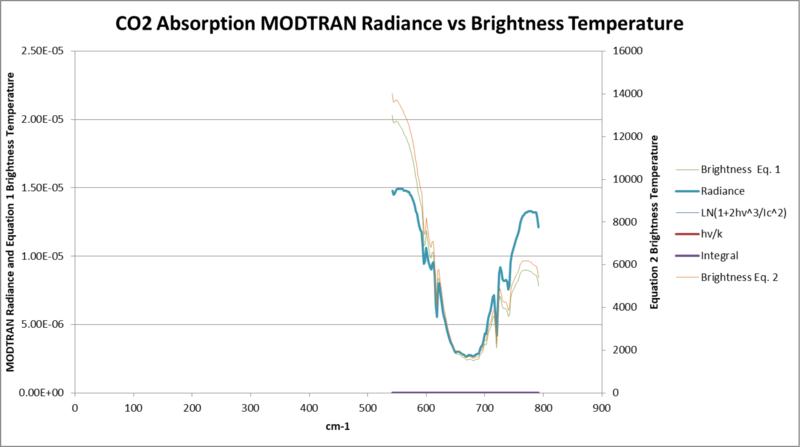 We discovered that the MODTRAN graphic can be acceptably reproduced in units of radiance on the same axis if the Total Radiance output is scaled by 10^4. That’s a lot of scaling. We have done our share of scaling to make things comparable, but always with far more modest scaling factors. At 10^4 you approach a realm where scaling matters for stuff like quantum effects. We also discovered that an eerily visually similar result can be achieved on separate axes without scaling if another .2 increment (of 10^-5 W/m2) is added to the Total Radiance axis. This essentially stretches the axis, thereby compressing the CO2 deviation. Wow. What does all this have to say about the reliability of temperatures implied by the relationship between the Planck curves and the CO2 deviation? Ultimately the scaling (or compressing) exercise is about getting the Total Radiance away from the deviation close to surface temperature. Nobody believes that over a wide area like the tropics, anything is radiating 10-15 degrees above surface temperature, as our first efforts implied. Once you take the plunge of setting the top of the deviation reasonably below surface temperature, things appear to fall into place nicely. The shape of the P and R rotations on either side of the fundamental bend, and the top corners of the deviation match the Planck curves too well to deny a relationship. The graphic below appears on the University of Chicago MODTRAN website. Most of the old satellite radiances are plotted against Planck curves. It is dissapointing that no mention is ever made that the measured radiances are grossly scaled or massaged to fall in line. We humans kick up a lot of dust and burn a lot of stuff. A concept developed in the 1970’s was the “human volcano”. There is a lot of truth in this analogy. Back then, despite dead wrong rants, the sober scientific consensus was that it was unclear whether the net effect of the human volcano was to warm or cool the planet. The quote above from Kenneth Watt, a self-appointed and widely read guru, in 1970. He was worried about cooling. Nobody worries much about “nitrogen build-up” these days, nor cooling; we have new witches to burn. Al Gore likened the CO2 greenhouse effect to a blanket, keeping the planet warm by reducing energy loss to space. This might work if the blanket was a “space blanket”with a coating to reflect the dim light radiated from the surface back down. If you have ever used a space blanket to stay warm, you will know that it helps, but you would much rather have a down blanket. This is because conduction and convection are very important as well as radiation, and the down blanket reduces conduction and convection better than a space blanket. Somewhat more sophisticated came the argument that rather than a blanket, the greenhouse effect relies on pushing the “net radiative altitude” higher. Since the troposphere cools with altitude, and radiative intensity varies to the fourth power of temperature, pushing this radiative altitude higher would reduce radiation to space. We will show that significant CO2 radiation to space comes from the stratosphere where temperature increases and radiation to space increases to the fourth power of increasing temperature with increasing concentration. 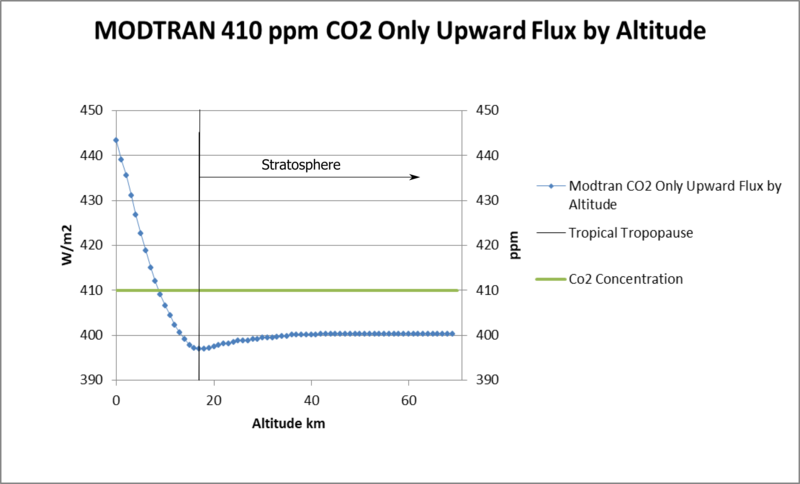 According to MODTRAN, as seen from the altitude of polar orbiting satellites at 70 km, the fundamental bend of CO2 (and its rotations) radiates at a temperature of 220K. This temperature corresponds to an altitude of 12-13 km at the tropical lapse rate. The atmosphere continues to decline in temperature in the tropics to 17 km, where the lapse suffers a relapse and the atmosphere begins increasing in temperature with altitude. 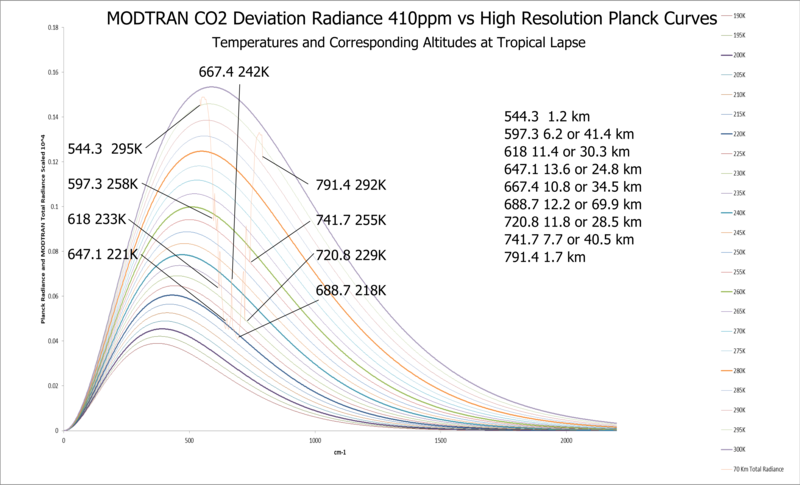 If you set MODTRAN to 410 ppm CO2, and set all the other greenhouse gasses to zero; you can vary the altitude to see where the CO2 radiance is coming from. Above you can see that the total IR upward flux looking down from the tropopause at 17 km is 397.21 W/m2. You can also see that without the other absorbing gasses, the planet radiates at the Planck curve for surface temperature except for the deviations caused by CO2. The lowest part of the CO2 deviation is seen radiating at the temperature of the 17 km altitude, about 195K, as seen from the blue lapse curve to the right. When we jump up to 70 km we see that the upward IR flux increases to 400.35 W/m2. This means that 3.14 W/m2 of the CO2 radiance polar orbiting satellites at 70 km see is coming from the stratosphere. As you can see from the blue lapse curve to the right, temperature increases with altitude in the stratosphere. The bottom of the CO2 deviation conforms to and radiates at the 220K Planck curve, a temperature 25 degrees higher than the bottom of the deviation at 17 km. In the tropical atmosphere, 220K matches an altitude of 24 km in the stratosphere. When we drop down to 24km the upward flux is 398.15, meaning that 2.2 W/m2 of the CO2 radiance seen from 70km takes place above 24 km. We decided to continue the exercise above and record the MODTRAN upward radiance at one meter and thereafter at 1 km increments to 70 km. It can be seen that CO2 radiance increases in the lower stratosphere and then levels out beginning at 43 km. Seemingly, 43 km is the last inflection point in CO2 radiation to space. We began this post with examples of muddled thinking about the impacts of human absorptive gasses in the atmosphere. We end the post having presented data indicating that we need a far more nuanced approach. 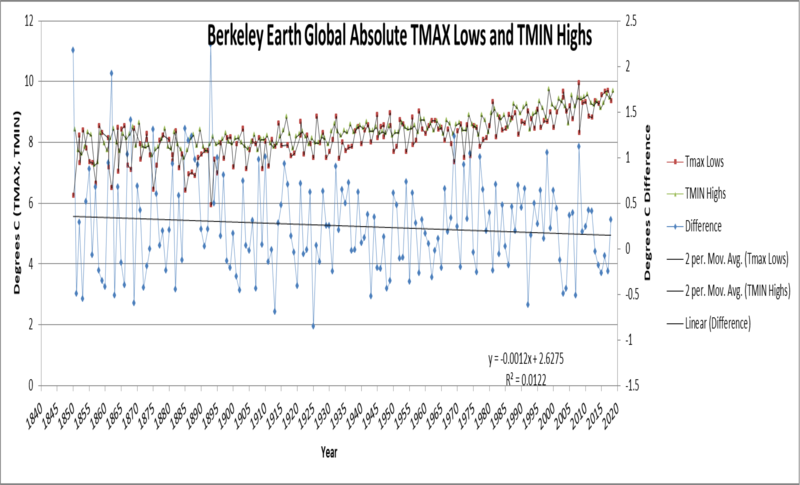 Bob Tisdale recently did a series of posts exploring the differences between using absolute temperature and temperature anomaly to understand the recent temperature evolution of our planet. Bob was interested in the extracted TMAX highs and TMIN lows, and showed that the TMIN lows have warmed about twice as fast as the TMAX highs. We had never seen an analysis like this, and what struck us was the how close the lowest seasonal maximum temperatures were to the highest seasonal minimum temperatures. The closeness of these values in absolute terms suggests a conserved quantity or thermostatic mechanism. Above it can be seen that while the seasonal fluctuations in average maximum and minimum temperatures are on the order of 15C, the difference between the lowest highs and the highest lows averages only .25C. As the earth rotates, each day the sun warms every location on earth, creating each location’s daily high temperature or TMAX. Locations then rotate into darkness, creating the daily low temperature or TMIN. The graphic above is averaging these lows and highs, essentially treating the entire planet as a single location. The simple explanation for the closeness of the TMAX lows and the TMIN highs would be that the temperature is “handed off” from the top of the low to the bottom of the high. This is not the case because the TMAX lows vary between November and February, and the TMIN highs are nearly always in July. Above we got rid of the seasonal amplitude to focus on the difference between the high lows and the low highs. It can be seen that as the planet has warmed, the difference has diminished. 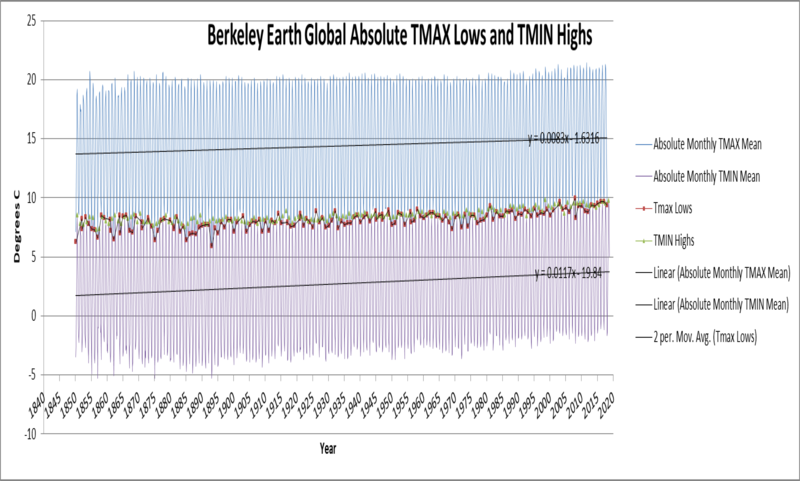 This reduction in the difference is a clue, but it is not really surprising since we know that the planet has warmed more at the poles, and more in TMIN than TMAX. Essentially, the planet is warming more at the cold extremes. 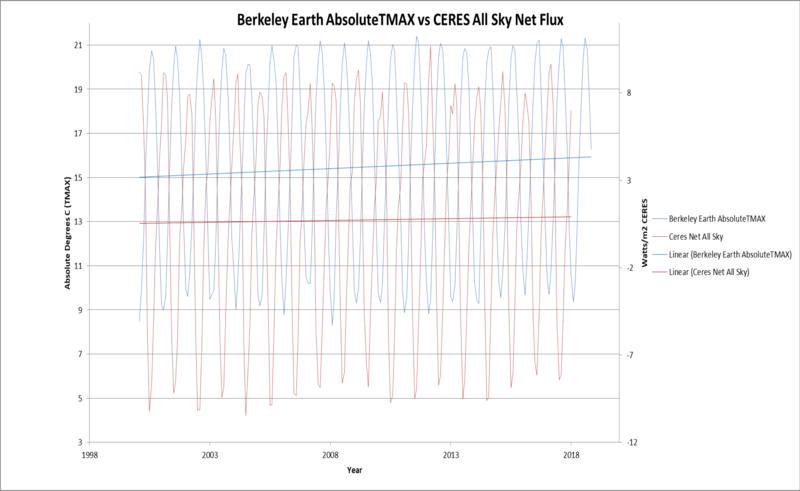 We thought it would be interesting to compare Berkeley absolute TMAX with CERES net flux. It can be seen in the unsurprising result above that the highest temperatures correspond to periods of negative net flux to space; and the reverse. The TMAX highs typically lag the net flux lows by a month. It can also be seen that the TMAX warming over the CERES period was not caused by a reduction in radiation to space. Radiation to space actually increased slightly over the period. The apparent thermostatic control that limits the TMAX lows and the TMIN highs to such a narrow range is probably the elastic nature of the specific heat of the ocean. The capacity of water to store energy increases as the water warms, and decreases as the water cools. It works like a rubber band.